22.67% of people buy The Foreigner and Geostorm ~ Blu-ray. "Great movie well worth the watch"
The IRA took his family. Now he must get revenge. Present Day. Quan, an ex-Viet Cong fighter, has escaped to the United Kingdom with his daughter and become the proud owner of the Double Happiness Chinese Takeaway. He has quietly started settling into middle age – until a resurgent IRA bomb rips through a Knightsbridge store, killing his daughter instantly. Heartbroken, Quan asks the authorities for justice. But when the authorities fob him off, Quan decides to take matters into his own hands, and travels to Ireland to extract revenge. However, the bombings are the work of an unsanctioned IRA unit, operating against the wishes of the now-retired IRA old guard, or at least, most of them. Determined to find out who is behind the bombings, one of the ex-IRA leaders, Liam Hennessy, sets a trap for the splinter unit. Amidst the politics, lies and double-crosses, Quan and Hennessy find themselves fighting against each other, but with the same aim: to bring the bombers to justice. 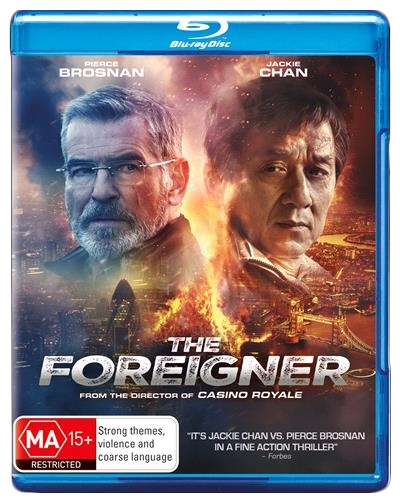 “The action here, both with and without Chan, is outstandingly staged, with much credit needing to go to director Campbell, who also helmed Brosnan's debut as James Bond in "Goldeneye” as well as Daniel Craig's amazing Bond reboot "Casino Royale.""